Rechargeable domestic batteries have now greatly improved performance. To save money and the environment they should be the preferred choice for all uses apart from old equipment that cannot accept them. Single cell rechargeable batteries (e.g. 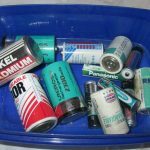 AA, AAA) are 1.2 Volt, while non-rechargeable batteries are 1.5 V. These non-rechargeable batteries are sometimes called disposable or alkaline batteries. Rechargeable batteries of 3.6 V, are simply three 1.2 V cells wired in series. 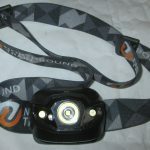 With old fashioned torches or bike lights, the 1.5 V will cause the torch to shine brighter than the 1.2 V ones, so they seemed a better buy. Most modern, battery powered, electrical equipment have voltage regulators that make the voltage to the equipment the same whether batteries are rechargeable or not. Some items like radios, have a toggle switch that is switched for either rechargeable or non-rechargeable batteries. 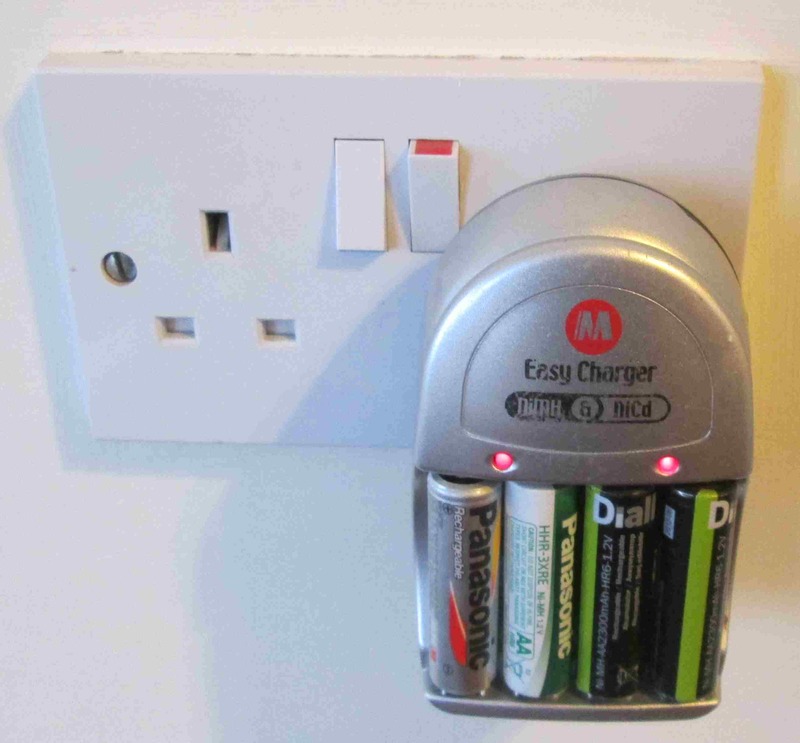 When buying battery powered devices, make sure they can take rechargeable batteries. If they say alkaline batteries only, these are for disposable batteries. Charging batteries is easy and only requires a mains plug-in battery charger. It is best to let the battery discharge fully before charging, to avoid reducing its future capacity; this problem nowadays is much less than it was in the past. The energy stored in rechargeable batteries is quoted in milli-Amp hours (mAh), but surprisingly is not usually stated on non-rechargeable batteries. 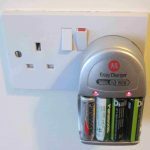 A rechargeable Nickel Metal Hydride (NiMH) AA 1.2 V, 2600 mAh battery costs between £2.00 – £3.00 while an alkaline non-rechargeable battery costs between £0.26 for a standard RS Components Ltd battery to £1.24 for a Duracell battery with an energy value 2900 mAh. The re-chargeable battery therefore costs between 2-10 times the price of non-rechargeable batteries. Rechargeable batteries can last 15 years of constant use, so easily win out in terms of cost and protection of the environment. The charging cost using mains electricity is negligible. Bike lights are now all light emitting diode (LED), so are brighter than old incandescent bulbs and use a fifth of the energy. Rechargeable batteries can die rapidly at the end of their charge, so for safety’s sake use two front and two back lights, in case one dies. 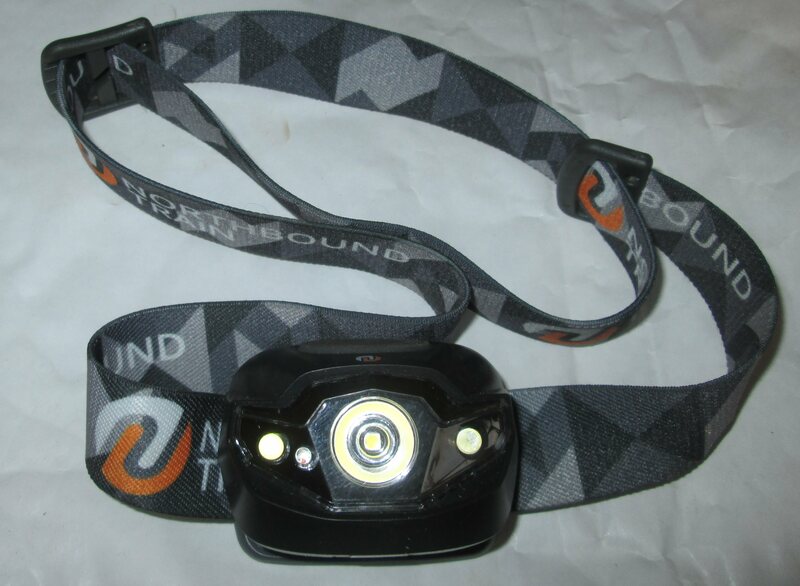 Many modern lights come with installed rechargeable batteries which can be charged from your computer USB socket. Always dispose of any household batteries in collection boxes in supermarkets, or in household waste recycling centres; never in the residual waste. 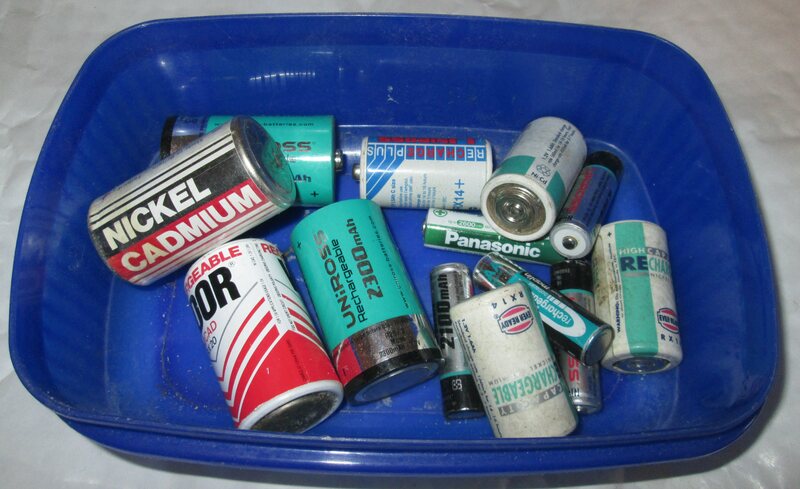 If we want to have batteries in future we must recycle the metals they contain.